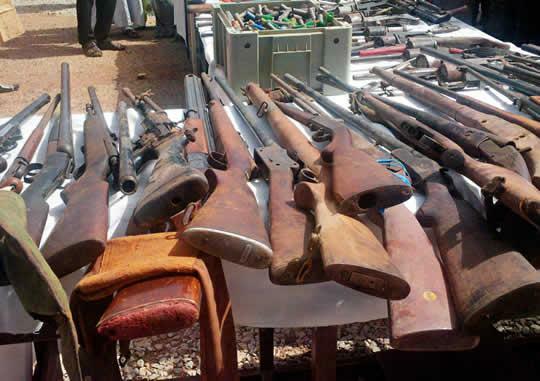 Men of the Nigeria Police Force, Niger State Police Command has uncovered an illegal firearms factory in the Mashegu Local Government Area of the state. It was gathered that the suspected manufacturers of illegal guns had been convicted by a court to serve as a deterrent to others. The Inspector-General of Police, Ibrahim Idris, had ordered the recovery of all prohibited firearms in all states in the country. The police in Niger State had recovered no fewer than 110 different types of guns and over 80 ammunitions from people. The spokesman for the command, Muhammad Abubakar, said those in possession of such weapons voluntarily submitted them to the command. According to him, a task force charged with recovering illegal arms has commenced full operation to curtail the increasing rate of insecurity in some parts of the country.